Meet Cooper!! He was rescued from a hoarder situation off a property with nearly 70 dogs. He was very shy but was doing okay with his original foster Mom who was working with him. He was adopted but unfortunately just a few months later he was returned- & he was worse than before! Not only was he trying to bite out of fear but he would pee & poop & panic! We knew he'd need some serious help! So we reached out to Sofu's Dog Care Training and Rehabilitation! He's now been in training for a few months! He's doing amazing but it's been a long road & he still has a long way to go. He's ready for a home that will give him the structure, exercise, rewards & love when appropriate & advocate for him every day so he can be a dog & love life with YOU! He is great with other dogs & cats ���� He is crate trained & also familiar with how to use a doggie door. He's fine with gentle, older kids, prefers women but getting better with men! 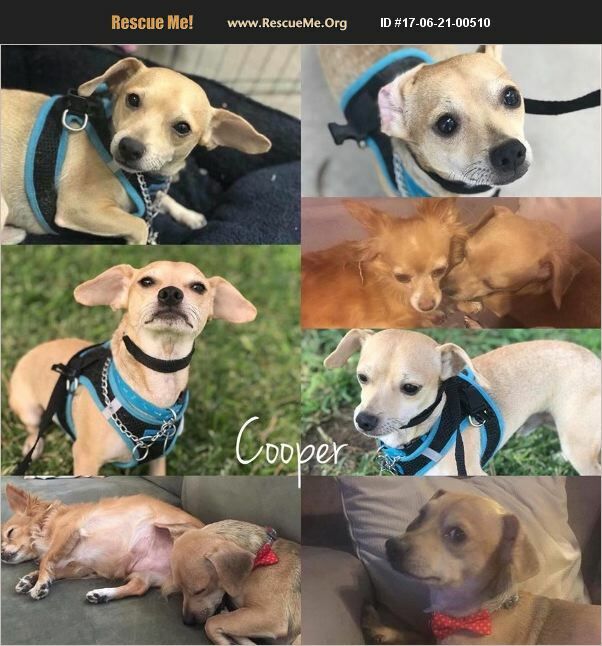 Cooper is looking for his happy furever where he can continue to blossom! Is that with you? Let us know if you're interested. He's about 2 years old & a chi-weenie. Neutered, vaccinated & microchipped. His adoption fee is $50.